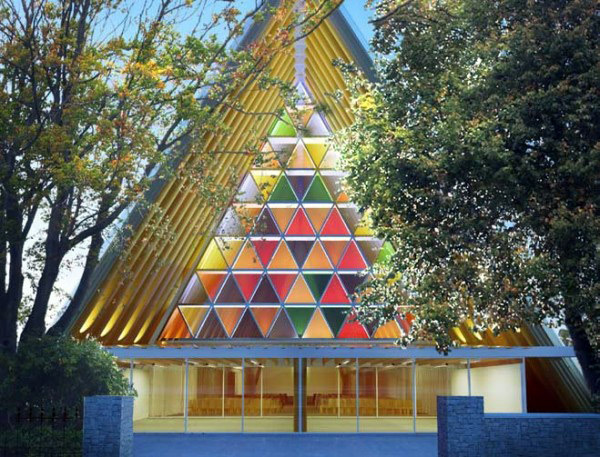 Shigeru Ban’s temporary cardboard cathedral finally got the green light to be erected in Christchurch, New Zealand. Now called the “Transitional Cathedral”, the building will replace a 19th century church that was heavily damaged in the 2011 earthquake – until funds for a permanent building are raised. The temporary building will hold 700 parishioners, it can be constructed with a fraction of the time and cost it takes to create a traditional building, and it can be re-erected for a different purpose in the future. Ban has utilized cardboard to create temporary, quick-to-assemble shelters after both the 2011Japan earthquake and the New Zealand quake. The Transitional Church will be supported by cardboard tubes pitched to create a cathedral ceiling that rises 80 feet. The material is both strong and lightweight, and can be assembled through relatively quick construction processes. The construction will also be a modest $3.8 million and will be completed before the end of 2012. Ban sees the building having a 20 year life span, so the community can deconstruct it in a few years and reassemble it for a community center or other purposes. The design also pushes the envelope (there a pun in here somewhere) on how large, low-cost and temporary buildings made from paper can fit into community needs with an esthetic intention. Ban’s cardboard church was designed only a couple of months after the earthquake, and since it can be locally sourced and easily removed it offers a vital new place for a community that is only now getting back on its feet. 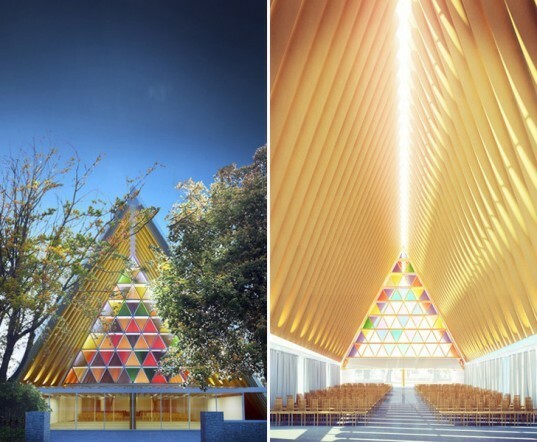 Shigeru Ban’s temporary cardboard cathedral finally got the green light to be erected in Christchurch, New Zealand. Now called the “Transitional Cathedral”, the building will replace a 19th century church that was heavily damaged in the 2011 earthquake - until funds for a permanent building are raised. The temporary building will hold 700 parishioners, it can be constructed with a fraction of the time and cost it takes to create a traditional building, and it can be re-erected for a different purpose in the future.